This page has links to all kinds of resources for working with patina and colour. 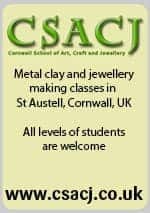 You’ll find information, tutorials and project guides about adding patina and colour to metal clay. Content checked June 2018. 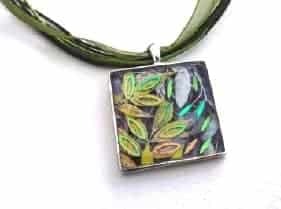 General article about adding a range of colouring techniques to silver clay. Download PDF’s of different sorts of patina methods. This comprehensive list of resources includes patina’s achieved by burying your pieces, fuming, liver of sulphur, Japanese patinas and more. Check it out! Short tutorial on using Liver of Sulphur to add colourful patina to your metal clay projects. Includes useful safety and usage tips. Perma Blue is found in the US where ever gun supplies are sold, so check all the sports stores. The chemical name – Selenium Dioxide. Patina formulas for brass, bronze and copper. This great blog post by Laura Bracken shows the results of testing a number of different sealents for colouring on metal. Very useful for anyone working with colour or patina. Great article showing how to seal patina or preserve the surface color of metal without losing the qualities of the color. This process was pioneered by Helga Van Leipsig. Here you’ll find a useful booklet. Learn high-temperature application of ceramic transfers to kiln-fired metal clay. This booklet will explain when to use this technique, which tools to use, and the application and firing process. Here is Helga’s presentation from the PMC Conference in July 2008. Each cold inlay powder is a mix of pure metal powders. Hadar’s Cold Inlay Powders are currently available in silver, gold, and black colors. The technique is called “cold inlay” because no firing is involved. Only the piece to be inlaid is fired. The inlay is done by filling the indentations of the fired piece with the inlay powder and adding a drop of CA (cyanoacrylate) glue. Once sanded, the inlaid powder looks just like fully sintered metal. For a demonstration of the process, please download the Instruction Manual for Hadar’s Cold Inlay Powders. Good step by step guide with pictures of how to use Gilders Paste. Sherri Haab’s image transfer process allows you to add photographic images to metal clay. The instructions for this can be downloaded here. You can add color to metal clay using Sherri Haab’s ITS. Download a PDF of the instructions here. This useful, well illustrated article explains how to transfer images onto resin clay. Download this tutorial from Holly Gage. This handout was written by Katie Baum for her workshop at the 2008 Art Clay UK Conference. Very useful tips and tricks guide. January 2007 newsletter focusing on texture and patina. In this intermediate level project learn an updated cloisonné method using resin instead of enamel. Resin is an incredibly versatile material. 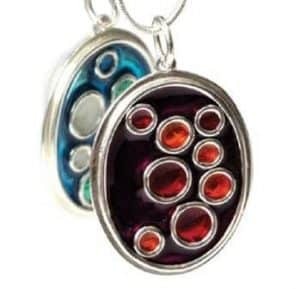 lLarn how to add different and unusual colours, materials and textures to it in silver plated pendants. By Clare John. In this project learn how to embed a picture or photo into your resin jewellery. 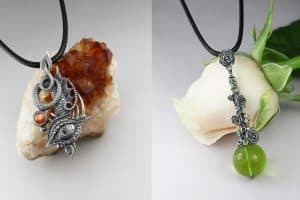 In this intermediate level project learn how to bond wire onto a pendant mount using epoxy glue. 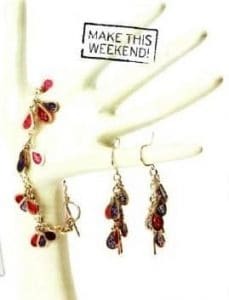 In this advanced level project learn how to make an open backed (plique-a-jour) resin drop bracelet. Lovely tutorial showing you how to make a resin charm with an embedded design. In this advanced level project learn how to make a bright, summery pendant using the champleve technique. 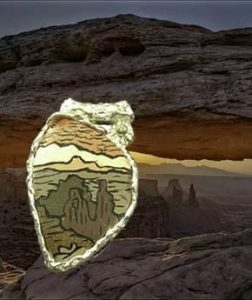 In this advanced level project learn how to make a double sided resin pendant. The following tips and hints were posted on the Yahoo! Metal Clay Group by Linda Gaughran. loose. When it gets where I want it, somewhere between “doesn’t flow” and “runs off the toothpick before I can get it to the piece”, I turn the mug warmer off and let the jar sit there as I work. Reheat as needed. I use a toothpick or bamboo skewer to pick up a blob of resin from the jar and then drop onto my piece. The blob stays attached to my skewer until I touch it down on the piece. You may need to coax the resin to the edges of your piece with your toothpick. Be sure to wipe up any threads or spills as they will harden on the piece too. Remember light cures it so don’t leave the lid off the jar very long if you’re working in bright light. I’m afraid of undercured resin so I usually give it two rounds of time under my auto-shutoff manicure lamp just to be sure. Probably not necessary but it eases my mind. That works fine for transparent colors too. I haven’t done opaques. I put the bottom of a cardboard shoebox upside down over the manicure light so that the UV light doesn’t leak out. And I try not to look at it when it’s on. Bad for your eyes. Don’t let the sticky residue on the top of the cured resin throw you. It comes off perfectly with just a swipe of the UV Resin cleaner. Conversely, if you’re doing multiple layers you don’t need to clean off the sticky residue between layers. It is really sticky though so don’t get dust in it between layers. This fabulous presentation includes details on how to use Prismacolor pencils on metal clay. It also includes how to use UV resin and Pebeo Vitreaglass paints. Interesting article about the origins of Keum Boo on Ganoksin. This article also talks about the mechanism by which Keum-boo works. It’s a theoretical article. It will be useful for anyone who wants to know more background on this ancient method of adding gold to silver. Useful introduction to adding gold foil to silver using the Keum Boo or Kum Boo process. This ancient Korean technique has been pioneered by Celie Fago. This downloadable tutorial is from PMC Connection. April 2007 newsletter focusing on Keum Boo and gold. Inspired by ancient “torques” – rigid collars that open in the front. This delicate, contemporary necklace has come a long way from its heavy, classical roots. Metal clay leaves attached to sterling silver and then decorated with Keum Boo. Published on Art Jewelry Magazine’s website. 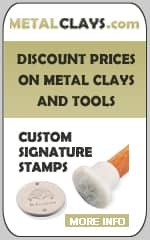 Manufacturer’s downloadable instructions from the Metalclay website on how to add AGS to your silver clay work. Use in conjunction with Petra’s additional instructions below. These downloadable instructions relate to the updated version of AGS released in 2009. This pdf also includes depletion gilding instructions to use AGS with sterling or Argentium silver. Petra from Metalclay has added some useful information to the manufacturer’s instructions from her own experience of using AGS. Download and use with manufacturer’s instruction sheet above. 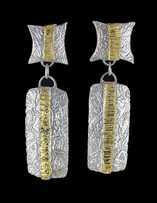 Learn how to add layers, embed sterling silver wire, and apply gold leaf Keum Boo to fine silver earrings. Useful tutorial from Janet Alexander. 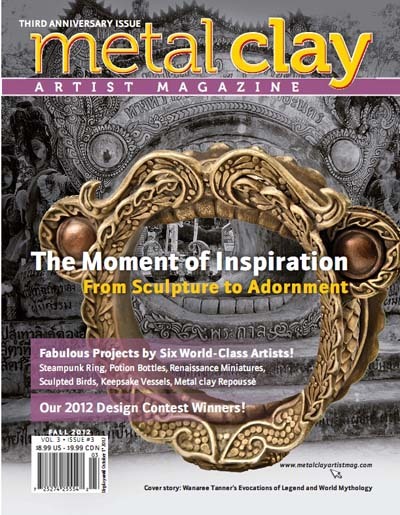 This great intermediate metal clay tutorial is free to view on the Cre8tive Fire website. 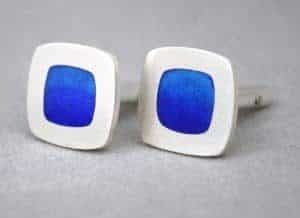 Try your hand at enameling with these simple yet elegant enameled cufflinks. Dichroic glass is simply beautiful, maybe you know it as “dichro” or “dicro”. The term refers to multiple ultra-thin microlayers of metal oxides which are evaporated onto the surface of glass in a vacuum chamber. These oxides change the way that light is transmitted and reflected. This means that as you turn the glass, the color changes. A dichroic coating appears to have additional colors when viewed from different angles. Enameling on fine silver metal clay, excerpts from the book: Enameling with Professionals by Lilyan Bachrach. Basic enameling process on copper. 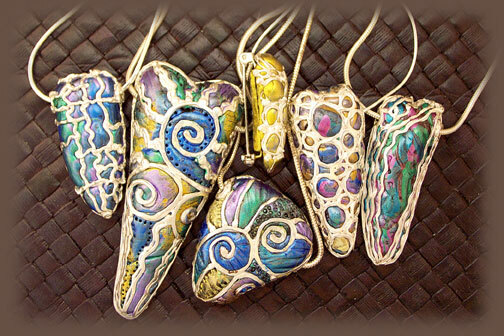 Great tutorial with pictures showing the process of adding designs to enameled pendants. Very thorough tutorial and easy to follow. It may be a cliché, but enameling is one of those techniques that takes a minute to learn, but a lifetime to master. If you’ve ever wanted to try enameling, don’t be intimidated, it’s very easy to get started. Karen L Cohen – What is Enamelling? Well explained project to make metal clay earrings coloured with Thompson enamels. This tutorial uses the technique of mixing the enamels with the metal clay to create coloured clay. Useful tips are given for what colours to use. 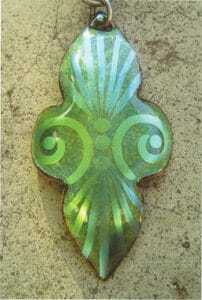 Article about basic enameling using a torch. Lots of useful information. So you’d like to try your hand at enameling but don’t have a kiln? Let’s start torch enameling! Easy to setup, fairly inexpensive and so much fun! This tutorial is aimed at metal clay and enameling artisans. It outlines the process for enameling on hollow forms. 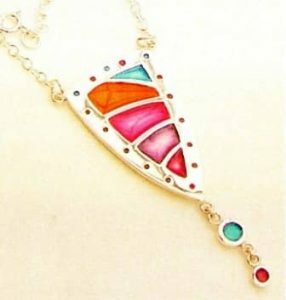 It assumes that you know the basics of enameling, such as preparing enamels, safety measures etc. October 2006 newsletter focusing on enamelling. Great tutorial from Wanaree showing you how to make and then enamel a silver metal clay panel. This page from the Copper.org website has several articles. One of these is a great outline of how Debra Weld creates copper panels using Prismacolor pencils. These are then attached to metal clay for the finished article. This great tutorial clearly explains how to use alcohol ink to add colour to metal clay. 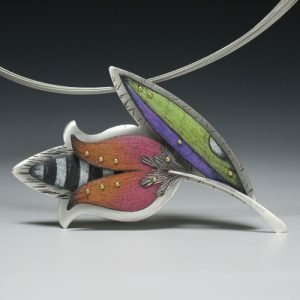 Interesting article about inlaying polymer clay designs into fired metal clay jewellery from Lorrene Baum-Davis. This downloadable tutorial shows you how to make a frame using polymer clay and Lisa Pavelka’s “Pavelka Peel” technique. This can be adapted for use with metal clay as an inlay. 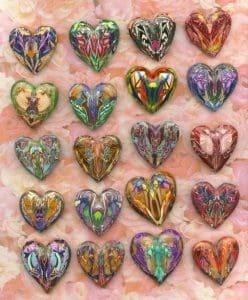 This blog post is based on sound design principles and uses scrap clay to produce colourful hearts. The technique could easily be applied to polymer for inlay into fired metal clay pieces. Downloadable Swellegant recipe tutorials from Christi Friesen.